The conduct of dominant enterprises is regulated by Section 4 of the Indian Competition Act 2002, as amended (Act). Section 4 prohibits the abuse of a dominant position by an enterprise or group. Notably, an abuse of a dominant position is prohibited, not dominance itself or the creation of dominance. The Act regulates the conduct of both private and public sector (state-owned) enterprises as well as departments of the government that engage in non-sovereign functions, across all sectors of the Indian economy. From 20 May 2009 (the date Section 4 entered into effect), the Competition Commission of India (Commission) has enjoyed exclusive jurisdiction for the enforcement of Section 4 of the Act. Section 60 of the Act states that the provisions of the Act shall have effect notwithstanding any inconsistent provision of any other law currently in force. In addition, Section 62 clarifies that provisions of the Act will operate in addition to the other laws currently in force. In early 2018, the total strength of the Commission was reduced from seven members comprising one chairperson and six members, to four members comprising one chairperson and three members. Under the Act, the Commission has wide powers of investigation and enforcement. When conducting investigations into alleged anticompetitive activities, the Commission is assisted by the office of the Director General (DG). Appeals from the orders of the Commission must be filed with the Competition Appellate Tribunal (Compat), the appellate tribunal. In May 2017, the Compat was merged into the National Company Law Appellate Tribunal (Tribunal). The Supreme Court of India (Supreme Court) is the final appellate authority for all matters under the Act. No formal policy statements in respect of Section 4 and its application have been made by the Commission to date, and the Commission’s decisions continue to remain the primary source of guidance for the application of Section 4. The Commission found infringements in seven cases: the three Coal India matters, BCCI,10 Google, GDA and DLF. The most notable among these is Google, where the Commission levied fines on Google of 1.35 billion rupees for abusing its dominant position in the online general web search and web search advertising services markets in India in violation of the provisions of Sections 4(2)(a)(i), 4(2)(c) and 4(2)(e) of the Act. In the remaining cases, that is, MSEB, Ola Cabs and Wave Distilleries, the Commission found no infringement of Section 4 of the Act. In another 14 cases involving claims of abuse of dominance, the Commission adopted a prima facie view under Section 26(1) of the Act directing the DG to investigate the complaints under Section 4 of the Act. Some of the important cases in which such orders have been rendered relate to the real estate sector (and involve state-owned builders and developers such as Delhi Development Authority (DDA)11 and Haryana Urban Development Authority (HUDA)), the broadcasting sector (where the Commission has directed two investigations against Prasar Bharti,12 which enjoys a monopoly position in providing infrastructure facilities and licenses to FM Radio broadcasters); and one investigation against Star India Limited13 for unilaterally imposing unreasonably high licence fees for the distribution and subscription of its channels as compared to some of its competitors. once the Commission came to a definite conclusion that the person holding [a] ‘dominant position’ has not abused its power and/or activities and its activities are not unfair and anti-competitive, in [the] absence of any specific evidence and finding, the Commission has no jurisdiction to issue any direction for the alleged prima facie case of contravention. The Supreme Court issued its first ever decision in Kansan,23 a case relating to Section 4 of the Act, where the Supreme Court clarified an important question of law relating to the application of the provisions of Section 4(2)(c) of the Act in relation to parties who are not in a competitive relationship. Importantly, the Supreme Court upheld the Commission’s findings on the merits of the case while overturning the findings of the Compat. The Supreme Court unfortunately limited its reasoning to the findings of the Compat without addressing the larger issue of whether there could be any competition-related rationale for a dominant firm to exclude a party that is not its actual or potential competitor, thereby exacerbating the concern raised by the Commission’s orders in the first DLF case: whether the Act’s substantive provisions can or should be invoked to address non-competition concerns. It may be recalled that DLF is arguably not a competition case at all, but rather a matter to be resolved under Indian consumer protection legislation. 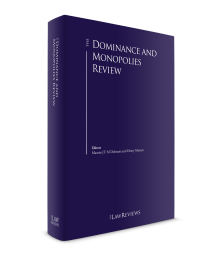 Market definition and market power remain the starting point of every competition law assessment for determining dominance and the abuse of dominance by an enterprise. The Act defines ‘relevant product market’ as a market comprising all those products or services that are regarded as interchangeable or substitutable by the consumer by reason of characteristics of the products or services, their prices and intended use. The notion of ‘relevant geographic market’ is defined in the Act as a market comprising an area in which the conditions of competition for supply of goods or provision of services or demand for goods or services are distinctly homogeneous and can be distinguished from the conditions prevailing in neighbouring areas. The notion of ‘relevant market’ is defined by the Act as a market that may be determined by the Commission with reference to the relevant product market or the relevant geographic market, or with reference to both the markets. In Section 19, the Act also identifies an exhaustive list of factors that the Commission must take into account in defining the relevant market. online advertising allows users an accurate monitoring of the effectiveness of an advertisement in terms of actual views. search and non-search advertising have different pricing factors: search advertising is priced based on cost-per-click and non-search advertising is priced based on cost-per-thousand impressions. Based on these reasons, the Commission found that online search advertising services constituted a distinct market. As regards the relevant geographic market, the Commission noted that the relevant geographic market for online general web search services and online search advertising services are national in scope. The Commission then concluded that the two relevant markets for a determination of dominance were the market for online general web search services in India and the market for online search advertising services in India. In Coal India and BCCI, after hearing the parties once again (since these cases were sent back to the Commission by the Compat for a fresh review), the Commission reconfirmed the determination of abuse of dominance by Coal India and BCCI. In Coal India, consistent with its past practice, the Commission refused to consider global markets. In BCCI, the Commission identified the relevant market as the market for the organisation of professional domestic cricket leagues and events in India. The market definitions adopted by the Commission in cases relating to the real estate sector continue to remain unpredictable because of the Commission’s inconsistent assessment. In contrast to the earlier DLF cases,24 where the Commission while defining the relevant market had classified residential apartments priced at 2 billion rupees (approximately) as high-end apartments, the Commission adopted an objective and price-neutral approach for defining the relevant market in the DLF case. In this case, where the residential apartments under scrutiny were priced in the range of 4 million to 6 million rupees, the Commission defined the relevant market as the market for the ‘provision of services for development/sale of residential apartments in Gurgaon’. This was consistent with the Commission’s findings in DDA and HUDA where, for the purposes of forming a prima facie view, the Commission adopted a price-neutral and objective market definition. However, in GDA, the Commission has once again identified the relevant market (with reference to the pricing of the apartments) of low-cost residential flats under affordable housing schemes for economically weaker sections. This flip-flop by the Commission in defining relevant product markets in the real estate sector remains inexplicable, and there is little likelihood of achieving consistency until the Supreme Court decides the appeal before it in one of the DLF cases (where DLF already has deposited with the Court a fine of 6.30 billion rupees) and addresses this matter. In Ola Cabs, the Commission identified the relevant market as the market for radio taxi services in Bengaluru (an Indian city) in assessing whether Ola Cabs engaged in predatory pricing by offering discounts to passengers and incentives to driver partners in contravention of the provisions of the Act. In MSEB, which involved competitive conditions in the power sector, the Commission noted that electricity distribution services constituted a separate market in comparison to electricity generation, transmission and retail services. The Commission identified the electricity distribution services market as the relevant market in the state of Maharashtra (except in Mumbai). Thus, even in 2017 and 2018, the Commission has continued to define India-wide and regional and local geographic markets. As previously stated, the definition of dominance restricts the Commission from defining global geographic markets, and the Commission expressly recognises this limitation in the Google case. In assessing dominance and market power in the relevant market, the Commission is required by Section 19 of the Act to assess dominance in the context of a broad range of non-exhaustive factors, including market share, size and resources of the enterprise in question, the size and importance of the competitors, vertical integration, entry barriers and the dependence of consumers on the allegedly dominant enterprise. The role and importance of each of these factors will vary on the facts of each case and the alleged theory of harm, but in its decisions, the Commission will assess dominance of an allegedly dominant enterprise under each of the Section 19 factors. Generally speaking, market share and the size and resources of an enterprise will be the most important criteria in the Commission’s assessment of dominance. In Google, despite acknowledging that in high technology markets (frequently characterised by network effects), innovation is key, and in multi-sided markets, market shares should be transient, the Commission found Google to be dominant in both the relevant markets, that is, the markets for online general web search services in India and online search advertising services in India. In arriving at this conclusion, the Commission, inter alia, took into account Google’s consistently high market shares over a period of time resulting from (in the Commission’s view) other technical and structural advantages enjoyed by Google that the Commission omitted to identify. In Coal India and MSEB, the Commission was of the view that the statutory and regulatory framework together with government policies led to the dominance of these state-owned enterprises (i.e., Coal India (as producer and supplier of coal) and MSEB (as the sole licensee in the electricity distribution services market in the state of Maharashtra (except for Mumbai)). On appeal, the Compat confirmed the Commission’s assessment of dominance of Coal India. In BCCI, the Commission concluded that BCCI’s dominance was the result of a number of factors, including its regulatory powers, control over infrastructure and control over players, and its ability to approve and control the entry of other leagues. The Commission did not assess market share information, presumably because BCCI already held 100 per cent of the relevant market based on its historical monopoly position. In DLF, despite adopting a different market definition when compared to the earlier DLF cases, the Commission did not separately assess DLF’s dominance in the market for residential apartments in Gurgaon. The Commission continued to base its assessment of DLF’s dominance upon the historical data used by it in the earlier DLF cases to hold DLF dominant in the relevant market, presumably on the basis that there has been no change in market dynamics, making the finding of dominance highly questionable. In the cases involving the state-owned builders and developers, i.e., DDA, GDA and HUDA, the Commission noted that these authorities had gained absolute control over the sale and development of residential and institutional or commercial plots, as the case may be, by virtue of the statutory framework in place and the financial support of the concerned state governments. As a result, no competitor in the market could match the size and structure of these authorities. In Ola Cabs, the Commission acknowledged that, in technology-based markets, high market shares are possible in the early years of the introduction of a new technology, but that these market shares are ephemeral and often fluctuate over a period of time. The Commission noted that even Uber had a comparable market share in the relevant market during the investigation. The Commission also took into account network effects. The Commission found that because Ola Cabs and Uber were vigorously competing with each other, the market had not tipped in favour of any player, and that most of the consumers were multi-homing on both platforms. Based on these findings, the Commission did not find Ola Cabs to be in a dominant position. The Commission also rejected the informant’s claim of collective dominance of Ola Cabs and Uber on the basis that the Act does not contain any provision for the assessment of collective dominance absent strong structural links in the form of equity participation. A similar claim of collective dominance was also rejected by the Commission in Wave Distilleries. uses its dominant position in one relevant market to enter into or protect another relevant market. Section 4(2) of the Act appears to contain an exhaustive list of conduct that would constitute abuse of dominance, unlike Article 102 of the TFEU. The list of ‘abuses’ in Section 4(2) is sufficiently broad, and could cover most exploitative and exclusionary conduct that could be characterised as an abuse of dominance. Section 4(2)(c), in particular, which prohibits any conduct by a dominant enterprise resulting in ‘denial of market access in any manner’, is frequently used by complainants or informants to cover exclusive dealing, refusal to supply and other theories of anticompetitive harm that do not fall within any of the other categories in Section 4(2). It is notable that the Act does not provide for objective justifications as defences to the anticompetitive conduct of dominant enterprises. In MSEB, however, while reviewing whether the long-term power procurement agreement between the sole licensee (in the power distribution services market) and one of its group companies led to denial of market access, the Commission took into account the justifications offered by the parties, including that the long-term agreements were concluded in difficult circumstances of power shortage and load shedding. In addition, the Commission also considered that the power supply from the group company only constituted 41 per cent of the total power requirement of MSEB with the remaining power requirement being met through third parties. On this basis, the Commission concluded that no case of infringement was made out against MSEB. Thus, in its MSEB decision, the Commission has taken these factors into account. Under the Act, the only defence recognised for the abusive conduct of a dominant enterprise is the ‘meeting competition’ defence. To date, the Commission has not provided any published guidance, including in its decisions, on the scope of this defence. In Google, while assessing Google’s conduct, the Commission emphasised the special responsibilities and obligations of dominant enterprises in digital markets. In the Commission’s view, digital markets are often characterised by network effects, which become more pronounced in multi-sided digital platforms. While acknowledging that network effects promote innovation, the Commission observed that: ‘it cannot be disputed that network effects can raise switching costs for users and barriers to entry for potential competitors. As a consequence, market entries become less likely and users switch less frequently to other suppliers, which has a market power enhancing effect.’ The Commission noted that since Google is the gateway to the internet for a vast majority of internet users, it is under an obligation to discharge its special responsibility resulting from its dominance in the online web search market. The Commission also stated that Google’s ‘special responsibility’ is ‘critical in ensuring not only the fairness of the online web search and search advertising markets, but also the fairness of all online markets given that these are primarily accessed through search engines’. prohibitions under the negotiated search intermediation agreements: prohibitions on publishers under negotiated search intermediation agreements were found to be an unfair imposition (under Section 4(2)(a)(i) of the Act), restricting the choice of these partners and preventing them from using search services provided by competing search engines. In Coal India, the Commission, following the Compat’s directions, conducted fresh hearings and passed orders against Coal India. Thereafter, the Compat also assessed the Commission’s findings against Coal India in a case concerning an e-auction scheme. Both the Commission (in recent orders) and the Compat found that Coal India, taking advantage of being the lone producer and supplier of coal in India (which is the most important raw material for power generation in India), abused its dominant position. The Commission found the terms and conditions imposed by Coal India through the fuel supply agreements to be unfair, particularly in relation to the grading of coal, sampling process, sampling and supply of ungraded coal, and force majeure. The Compat found that the conditions in the e-auction schemes were onerous and one-sided, which disturbed the normal contractual equilibrium. In MSEB, the Commission dismissed allegations of excessive pricing on the basis that the tariffs were set by the sectoral regulator under the Electricity Act, 2003. In DLF, the Commission noted that the terms and conditions of the apartment buyer agreements were similar to those previously examined by the Commission; and that DLF’s arbitrary conduct (of keeping buyers in the dark about the ultimate shape, size and location of apartments; increasing the number of floors without prior notification to buyers; increasing the super area of the apartments followed by unfair additional demands on account of such increase of the super area; and arbitrary cancellation of allotments and subsequent forfeiture of booking amounts) had been previously examined by the Commission in its earlier orders. Based on its findings, the Commission found DLF’s conduct to be in contravention of Section 4 of the Act. In Google, the Commission found a clause in the negotiated search intermediation agreements that required publishers not to implement search technologies on their sites that are the same or substantially similar to that of Google as restrictive of competition. The Commission also found that Google prevented partners with whom it entered into negotiated search agreements from implementing search services from a competitor providing similar or substantially similar search services. The Commission found that by restricting websites from partnering with competing search services, Google denied its competitors access to the search business and further marginalised them. These restrictions were found to be a de facto imposition of online search exclusivity in contravention of Section 4(2)(c) of the Act. The Commission also took into account the effects of the exclusivity clauses of the negotiated intermediation agreements in light of the network effects in the online search and search advertising markets and Google’s dominance in these markets. Although the number of intermediation agreements entered into with Indian partners were not substantial and the term of such agreements varied between two to three years, the Commission found that the exclusivity clauses created conditions for extending and preserving Google’s dominance in search intermediation in perpetuity. As a result, the Commission concluded that Google was using its dominance in the online general web search market to impose restrictive conditions in the negotiated search intermediation agreements in contravention of Section 4(2)(e) of the Act. In BCCI, the Commission found the BCCI Rules and Regulations, read with a clause in the media rights agreement executed with the broadcaster of Indian Premier League (IPL) stating the following – ‘it [BCCI] shall not organize, sanction, recognize, or support during the Rights period another professional domestic Indian T20 competition that is competitive to the league [IPL]’ – infringed Section 4(2)(c) of the Act. The Commission noted that these created an insurmountable entry barrier for organising domestic professional leagues and were not backed by any plausible regulatory rationale. In Kansan, the Supreme Court upheld the Commission’s findings relating to abuse of dominance by the multisystem operators (MSOs) who accounted for 85 per cent of the subscriber share in the cable television market of Punjab and Chandigarh. The Commission noted that the unilateral termination by the MSOs of the channel placement agreement with the broadcaster of a news channel called ‘Day and Night News’ violated the provisions of Section 4(2)(c) of the Act. On appeal, the Compat had set aside the Commission’s decision on the basis that the abuse of denial of market access, as contemplated by Section 4(2)(c), applies only to a situation where one competitor restricts the access of another competitor to the market. Since the broadcaster and the MSOs were not competitors, the Compat was of the view that Section 4 was not applicable. The Supreme Court, while analysing the provisions and purport of the Act, noted that the term denial of market access ‘in any manner’ is of wide import and must be given its natural meaning. Thus, once the existence of a dominant position is proven, the question of ‘whether a broadcaster is in competition with MSOs is a factor that is irrelevant for the purpose of application of Section 4(2)(c) which ... becomes applicable for the simple reason that the broadcaster is denied market access due to an unlawful termination of the agreement between the broadcaster and the Respondents’. Pending final determination of a case by the Commission, the Commission may issue interim orders restraining parties from engaging in anticompetitive activities during the course of an investigation. If an enterprise or group is found to have abused its dominant position, in terms of Section 27 of the Act, the Commission may impose fines of up to 10 per cent of the enterprise’s or group’s average turnover for the preceding three financial years. Keeping in view the principles of proportionality, while deciding the amount of penalty, the Commission takes into account any aggravating or mitigating factors based on the facts and circumstances of each case. In addition, the Commission may pass a cease-and-desist order together with any other orders or directions as the Commission may deem fit. So far, the Commission has not issued any guidelines on penalties. In a cartel case under Section 3 of the Act, the Supreme Court has clarified that for determining the amount of penalty, the Commission must take into account the relevant turnover (that is, the turnover generated from products and services affected by the contravention) as opposed to total turnover, which is considered by the Commission for the purpose of levying penalties. The Supreme Court held that any penal law imposing a punishment is made for the general good of society and emphasised the principle of proportionality, which requires that the penalties imposed must not exceed what is appropriate and necessary for attaining the objective pursued. During 2017 and 2018, the Commission found Section 4 contraventions by five enterprises, namely, Google, Coal India, DLF, BCCI and GDA. In Google, after considering the aggravating and mitigating factors, the Commission imposed a monetary penalty of 1.35 billion rupees at a rate of 5 per cent of the average of the revenues generated from Indian operations for financial years 2013, 2014 and 2015. Interestingly, the Commission noted that the concept of ‘relevant’ turnover cannot be applied to a technology platform such as Google in the same manner as it is applied in the context of a conventional multi-product firm. The Commission noted that this is because in ‘a two sided market, the search side is free whereas the other side is monetized through advertisements’. Although Google’s revenues from its various business segments were taken into account, the Commission ultimately considered a sum total of the revenues generated by Google only from its India operations for the purpose of calculating the fine. The Commission also imposed certain remedial measures. Following an appeal by Google, a ‘stay’ has been granted by the Tribunal upon payment of this fine until the Tribunal renders its order on the appeal. In both DLF and Coal India, since the Commission had already imposed a penalty of 6.3 billion rupees (at 7 per cent of the average of the turnover for the three preceding financial years) and 591 million rupees (at 1 per cent of the average of the turnover for the three preceding financial years), respectively, on the two enterprises in previous orders involving the same or similar facts, there was no fresh imposition of penalties on these enterprises. In BCCI, after rehearing the matter, the Commission confirmed its previous findings of abuse and imposed a penalty of 522.40 million rupees (at a rate of 4.48 per cent of the average turnover for the three preceding years) – the same as the penalty previously imposed. The Commission also passed certain ‘cease and desist’ orders against BCCI. In GDA, the Commission imposed a penalty of 10.06 million rupees (at a rate of 5 per cent of the average turnover for the three preceding financial years) and also passed ‘cease-and-desist’ orders. It is important to note that the Commission is empowered to proceed against company officers under the provisions of Section 48 of the Act. Recognising this power, both the High Court of Delhi (in the exercise of concurrent writ jurisdiction) and the Tribunal (as the appellate authority) have clarified that the Commission must record a finding of contravention against a company before proceeding against company officers under Section 48 of the Act. The Act provides the procedure for the filing of information (i.e., the complaint), the investigation process, the inquiry by the Commission and the procedure for appeal. Any person may file ‘information’ (i.e., a complaint) with the Commission (in the prescribed format together with requisite fees) alleging contravention of the provisions of the Act. The informant (i.e., the complainant) may also file an application with the Commission for interim measures by describing the harm that would be caused if no interim protection is granted. Once the information is filed, the Commission, as far as possible, is required to record its opinion on the existence of a prima facie case within 60 days of the filing of the information. If the Commission is of the opinion that there exists a prima facie case, the Commission may direct the DG to conduct an investigation into the alleged anticompetitive conduct and submit its report within the time specified by the Commission. Upon completion of an investigation, a non-confidential version of the DG’s report is provided to the informant and a confidential version of the report is provided to the enterprises under investigation. The parties are then directed to file their respective comments or objections to the report within the time limit specified by the Commission. Thereafter, the Commission schedules the case for hearing the parties – both the informant and the enterprises that allegedly infringed Section 4. The hearing is sometimes attended by a representative of the DG, but the DG is not present to defend the investigation report in all cases. Rather, in a case where the report finds an infringement of Section 4, the Commission relies on the informant to provide its submissions and, where the DG’s report is favourable to the informant, to defend the DG’s report. Where the report finds no infringement of Section 4, the Commission invites only the informant for a hearing before rejecting the information or complaint. The Commission is not obligated to accept the DG’s report, and there have been cases where the Commission has disagreed with the findings of the DG and rejected the report. An appeal against a final order of the Commission may be made to the Tribunal within 60 days of the date of the final order. An appeal against an order of the Tribunal may be made to the Supreme Court of India within 60 days of the date of the Tribunal’s order. Interim measures are available to parties before the Commission, the Tribunal and the Supreme Court of India. Frequently, parties also file writ petitions before the high courts if they believe that principles of natural justice are being violated or their legitimate legal rights are being ignored by the Commission. Although the Act does not provide for private enforcement, it does allow a successful informant or any other person affected by the findings of the Commission to make an application before the Tribunal for compensation from the dominant enterprise based on the findings of the Commission or the orders of the Tribunal. The Compat and the High Court of Delhi (in the exercise of concurrent writ jurisdiction) have been critical of the Commission for procedural lapses, and have highlighted some of the fundamental (and fairly obvious) rules of procedure previously ignored by the Commission. For example, an order of the Commission must be signed by those members of the Commission who have heard the parties. As a result, any order of the Commission signed by a member who has not attended a hearing must be set aside. In addition, a party under investigation must be provided with all the materials and evidence being used against it. The affected parties must also be given notice if the Commission decides to differ from the findings recorded by the DG in the investigation report. In addition, the right to conduct a cross-examination has been recognised. On the question of the DG’s investigative powers, the Supreme Court has clarified that it is well within the DG’s powers to expand the scope of investigation, and has observed that a Commission’s order directing an investigation under Section 26(1) of the Act is merely the starting point for the DG. For conducting investigations into anticompetitive practices, the DG’s office has been conferred with wide-ranging investigation powers for collecting evidence, including the powers of a civil court under the Indian Code of Civil Procedure, 1908. The DG is also vested with the power to use ‘dawn raids’ or unannounced search and seizures to inquire into allegations of anticompetitive conduct (including abuse of dominance), and the parties being raided have an obligation to cooperate during the search. Dawn raids may also be carried out by any person appointed by the DG in this regard. While conducting a raid, the DG or any person authorised by him or her for this purpose has been granted the power to enter any premises, conduct a search at the premises, and seize books, papers and electronic media that he or she considers necessary for the purpose of the investigation. These raids generally occur without any warning and are usually conducted at times that are least expected, often in the very early hours of the morning; they may even occur over a weekend. Search and seizure operations are planned in a highly confidential manner, leaving no room for the party under investigation to scuttle the search or to ‘sanitise’ the records. If a company has several offices, it is possible that simultaneous raids will be conducted at more than one office of the company. Dawn raids are regarded as an effective tool for inquiry into anticompetitive practices, and are authorised by the Chief Metropolitan Magistrate, New Delhi through a warrant. These dawn raid powers have been used sparingly and, thus far, there have been two instances of dawn raids in India: the first case relating to an abuse of dominance investigation against a worldwide manufacturer of excavators and back-hoe loaders, and the second case relating to a cartel investigation arising from a leniency application. The raid conducted by the DG in the abuse of dominance investigation is presently under appeal before the Supreme Court. While the DG reportedly has obtained significant damaging evidence against the allegedly dominant firm from the dawn raid in the abuse of dominance case, the DG’s investigation has been paralysed by court proceedings. This matter is currently before the Supreme Court, and the DG has been restrained from using the evidence obtained during the dawn raid until the conclusion of these court proceedings. Having learnt from its experience in the dawn raid in the abuse of dominance case, the Commission successfully concluded the cartel investigation in the second case involving a cartel of dry cell manufacturing companies, where the DG had simultaneously conducted dawn raids at the premises of three dry cell manufacturing companies. Interestingly, following the raids conducted by the DG, the other two companies (which were being investigated for suspected cartelisation) also filed leniency applications and admitted to cartel activity. With the dawn raid success in the cartel case, it is likely that dawn raids will become more frequent, and companies in India must be prepared for such raids in investigations under both Section 3 (prohibition of cartels) and Section 4 (prohibition on abuse of dominance) of the Act. In the Ericsson writ petition, the High Court of Delhi upheld the Commission’s jurisdiction to examine issues covered by the Act and held that matters covered under the Act do not fall within the domain of the patent enforcement authorities under the Indian Patents Act, 1971. This decision is currently under appeal before a division bench comprising two judges of the High Court of Delhi. In the Jio writ petition, the High Court of Bombay ousted the Commission’s jurisdiction to examine issues relating to the telecom sector, which was held to be exclusively governed by the jurisdiction of the Telecom Regulatory Authority of India Act. This decision of the High Court of Bombay has been challenged by the Commission before the Supreme Court. 1 Anand S Pathak is the managing partner at P&A Law Offices. 2 Case No. 08/2014, In Re: GHCL Limited v. Coal India Limited & Ors; case No. 05/2013, In Re: Madhya Pradesh Power Generating Company Limited v. South Eastern Coalfields Limited and others; case No. 07/2013, In Re: Madhya Pradesh Power Generating Company Limited v. South Eastern Coalfields Limited and others; case No. 37/2013, In Re: West Bengal Power Development Corporation Ltd v. Coal India Limited and others; case No. 44/2013, In Re: Sponge Iron Manufactures Association v. Coal India Limited and others; case No. 3/2012, In Re: Maharashtra State Power Generation Company Limited v. Mahanadi Coalfields Ltd and other; case No. 11/2012, In Re: Maharashtra State Power Generation Company Limited v. Western Coalfields Limited and other; case No. 59/2012, In Re: Gujarat State Electricity Corporation Limited v. South Eastern Coalfields Ltd and other. 3 Case No. 61/2010, In Re: Surinder Singh Barmi v. The Board of Control of Cricket in India. 4 Case No. 7/2012, In Re: Matrimony.com Limited v. Google LLC and Others; case No. 30/2012, In Re: Consumer Unity and Trust Society (CUTS) v. Google LLC and Others. 5 Case No. 86/2016, In Re: Satyendra Singh v. Ghaziabad Development Authority. 6 Case No. 01/2014, In Re: Ashutosh Bharadwaj v. DLF Limited and Others. 7 Case No. 12/2014, In Re: Vidarbha Industries Association v. MSEB Holding Company Limited and others. 8 Case No. 6/2015, In Re: Fast Track Call Cab Pvt Ltd v. ANI Technologies Pvt Ltd; case No. 74/2015, In Re: Meru Travel Solutions Pvt Ltd v. ANI Technologies Pvt Ltd.
9 Case No. 47/2014, In Re: Dwarikesh Sugar industries v. Wave Distilleries and Breweries Ltd and others. 10 Case No. 61/2010, In Re: Surinder Singh Barmi v. Board of Control for Cricket in India. 11 Case No. 78/2016, In Re: Sudarshan Kumar Kapur v. Delhi Development Authority. 12 Case No. 29/2016, In Re: Next Radio Limited v. Prasar Bharti and another; case No. 19/2017, In Re: Clear Media (India) Private Limited v. Prasar Bharti and another. 13 Case No. 13/2017, In Re: Thiruvanthapuram Entertainment Network v. Star India Limited. 14 Case No. 08/2016, In Re: Justickets Pvt Ltd v. Big Tree Entertainment Private Limited and others. 16 Appeal No. 80/2014, Coal India Limited and another v. Competition Commission of India and others; appeal No. 81/2014, Coal India Limited v. Competition Commission of India and others. 17 Appeal No. 67/2016, Prem Prakash v. Competition Commission of India and another. 18 Appeal No. 33/2016, Anand Parkash Agarwal v. Dakshin Haryana Bijli Vitran Nigam and others. 19 Appeal No. 9/2017, DLF Home Developers Limited and Another v. Competition Commission of India. 20 Appeal No. 70/2016, Financial Software & Systems Private Limited v. Competition Commission of India and others. 21 Competition appeal No. 21/2017, Shivam Medicos v. Competition Commission of India and another; Competition appeal No. 14/2017, Bablu and Company v. Fatechand Company and others; Competition appeal No. 04/2017, Subodh Kumar Sharma v. Competition Commission of India and others; Competition appeal No. 34/2017, Usha Roy v. Competition Commission of India; Competition appeal No. 2/2018, Nikunj Sisodia v. Earth Infrastructure; and Competition appeal No. 04/2018, Wing Commander Jai Kishan and another v. Concept Horizon Infra Private Limited. 22 Competition Appeal No. 6 of 2017, Karnataka State Road Transport Corporation v. Sree Gajanana Motor Transport Company Limited and others. 23 Civil Appeal No. 7215/2015, Competition Commission of India v. M/s Fastway Transmission Pvt Ltd and others. 24 Case No. 19/2010, In Re: Belaire Owner’s Association v. DLF Limited and others; case No. 18/2010, In Re: DLF Park Place Residents Welfare Association v. DLF Home Developers Limited and others; case No. 67/2010, In Re: Magnolia Flat Owners Association and another v. DLF Universal Limited and others.